"We had an extremely memorable stay in Casa dei Limoni in a place which felt special and off the tourist beat. We were very well looked after by the owner and her mother." Liguria, also known as the Italian Riviera, is a natural beauty, its impressive mountains vying for attention with valleys full of flowers; abundant local produce celebrated in numerous festivals. And by the sea, upmarket towns, elegant promenades and 25 Blue Flag beaches alternate with natural harbours, worn into the coastline over centuries. In the middle of this curving coastline sits the historical port of Genoa. Known as ‘La Superba’, it was once central to the Mediterranean’s most powerful maritime republic. On one side is the Western Riviera, home to resorts such as Sanremo. Head east and, nearer our villa, you’ll find the stunning Cinque Terre, Portofino and the Gulf of Poets. Alongside Genoa’s more contemporary architecture, the ancient buildings and narrow alleyways (carruggi) of its old town present a captivating contrast. Discover the 16th-century Palazzi dei Rolli, one of the spectacular Renaissance palaces on the Strada Nuova, a World Heritage Site: itself a work of art even before you add museum showcases and paintings by the likes of Rubens, Van Dyck and Durer. Designed by renowned architect Renzo Piano, Genoa’s aquarium impresses even before you meet the inhabitants of its enormous viewing pools. Wander around and you’ll see dolphins, seals, sharks and an array of technicoloured fish in close-up. Perched perilously on cliff-sides and another of Liguria’s UNESCO World Heritage Sites, the five poetically pretty medieval villages of Le Cinque Terre make for a memorable day out. Over centuries, formidable castles and churches gardens; paths and tunnels and plentiful vineyards have been laboriously carved out of the rocks. We suggest driving to Levanto and joining a motorboat excursion to appreciate the spectacular coastline and stop off at some of the beaches. Or, if you’d prefer to walk, a series of stunning hiking trails meander between the famous pastel houses, taking in museums, churches and viewpoints along the way. Sheltered from strong south-westerly winds, the Gulf of La Spezia resides more familiarly under the name of the Gulf of Poets: a homage to the literary giants, Byron and Shelley (Mary and Percy) who lived there in a house right by the sea, as well as visitors including George Sands, DH Lawrence and Virginia Woolf. “I still inhabit this Divine Bay, reading dramas and sailing…” Shelley once wrote and it’s easy to see why this captivating stretch of rugged coastline could inspire, with its beaches, perfectly clear waters and pretty towns, Portovenere, La Spezia and Lerici among them. Once a simple fishing village, Portofino has blossomed into a charming coastal town with narrow streets embracing a collection of expensive boutiques, jewellery shops and art galleries, as well as general stores with all the ingredients you need for a picnic. Out of season, consider driving here on the Via Aurelia (the old coast road) to enjoy stunning sea-views before mooching around the village’s elegant harbour. Then take a boat trip to the island of San Fruttuoso or stride up the headland to Castello Brown. Once fortified, the building is now a gallery and museum with terraced gardens and more wonderful views. As well as being famous for flowers, Liguria also has a reputation for fine local produce, including peaches, asparagus, artichokes, mushrooms and tomatoes. Pesto – made from fresh basil, garlic, pine nuts, Parmesan, pecorino and extra virgin olive oil from the nearby olive groves – is another regional speciality. It’s served with various pastas, such as trenette (narrow, flat) and fidelini (long, thin) plus corzetti (pasta discs) and ravioli. For a tasty takeaway snack, the locals’ favourite is farinata, a savoury pancake made from chickpea flour. Another speciality is torta Pasqualina, a thin-crust pie stuffed with spinach or chard, ricotta cheese and eggs. Equally filling, fugassa is a soft, thick focaccia covered with onion slices and olive oil. Local meat dishes include cima genovese (cold veal stuffed with green vegetables and cheese) and a hare stew that uses locally grown taggiasche olives, pine nuts and rosemary. 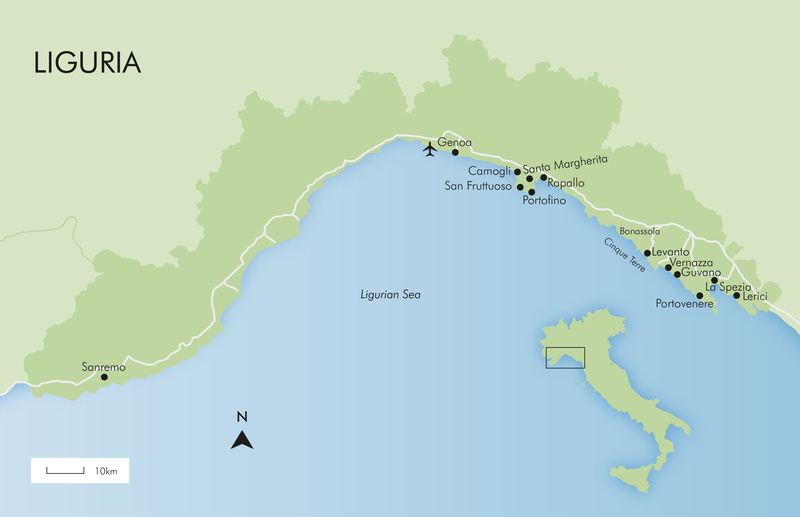 With Liguria hugging over 300 kilometres of coastline, the region is well-known for seafood. Stockfish (usually cod, always wind-dried) and triglie alla genovese (mullet cooked with mushrooms and tomatoes) are popular, as are stuffed and fried sardines or anchovies. You’ll also find ciuppin and buridda fish soups on many menus, alongside minestrone soup – allegedly invented in Liguria. Those with a sweet tooth can indulge in pandolce genovese (Genoa cake), amaretti (almond flavoured macaroons), cubeli (tiny butter cookies) and pacciugo (an ice-cream mixed with fruit). Liguria’s quality red wines include Ormeasco, made from the ancient Dolcetto grape, and Rossese – a delicate red from the municipality of Dolceacqua (it’s also known just by this place of origin). Others include Ciliegiolo (meaning cherry), which is becoming rarer as the grape is hard to grow, and Pollera Nera from the coastland east of Genoa: the Riviera di Levante. The region’s white wines include Vermentino, also known as Pigato, and Albarola. The latter is available as a stand-alone wine or blended with Vermentino and Bianchetta Genovese (also called Scimiscia) – one of several Bianchetta variations. This shingly beach is flanked by two spurs of rock: La Punta del Carlino and Punta della Madonnina. The water is clear and blue, ideal for swimming and snorkelling. Close to the Cinque Terre, Bonassola is just a 3-minute drive from our villa. You need to pay a daily fee for the use of sun loungers and parasols on parts of the beach; the rest is free. You’ll find bars and restaurants in the town behind the beach. This small, pebbly beach is a good choice on windy days, as its sheltered position helps keep the waves calm. Easily reached on foot or by bike (available from the villa) via a short tunnel, Framura is just 1km away. There’s a small restaurant providing meals and snacks. Fegina is a long sandy beach in the new part of Monterosso, right in front of the train station. Restaurants, pubs and ice-cream shops occupy the nearby promenade. A 30-minute drive from the villa or get to any of the Cinque Terre villages and take the train that goes between them. You can either choose to pay for a parasol and deckchair, or settle in a free area. This is a sandy beach, near the boats-for-hire area, that’s divided into public and private zones: stabilimenti (where you pay) and spiaggia libera (where you don’t). As for Fegina, except it’s a 10-minute walk from Monterosso station. Turn left along the promenade towards the Old Town. Pass the tunnel and the beach is on your right. The trail to Vernazza starts nearby. There are two beaches here. The smaller, sandy one with calm waters sits within the harbour; the larger, stony beach is just two minutes from the village centre. The harbour beach is two minutes’ walk from the railway station. The other is two minutes further on from the main village street, after turning left through the cave. Vernazza is crowded with tourists throughout the season. A few kilometres from Corniglia, this ‘secret’ sand-and-stone crescent became famous in the 1960s as a hippy hangout. It’s now a ‘clothing optional’ beach with turquoise waters perfect for swimming. From Corniglia railway station, pay to enter the abandoned (but illuminated) railway tunnel and walk for about 15 minutes. Guvano is famous for its microclimate that favours an extraordinarily beautiful maquis shrubland (macchia mediterranea), rare for this part of the coast. This prettily painted settlement is a magnet for yachties and other tourists, yet still exudes an air of tranquillity. Browse the boutiques, jewellery stores and art galleries; relax in a café or restaurant near the harbour or visit the Church of St George on the headland. Standing on the Strade Nuove, these beautiful palaces boast grand staircases, frescoes, courtyards and gardens – as well as UNESCO World Heritage status. Previously, residents randomly selected from the ‘rolls’, had to move out for state visits; now the buildings are open to everyone. On the Gulf of Poets, San Terenzo’s castle includes a Mary Shelley museum, while the pretty town of Lerici was home to her and husband Percy, until his death. Its main attractions are an imposing castle and the ferries going to Portofino and the Cinque Terre. The 13th-century frescoes and entrances of Genoa’s Metropolitan Cathedral of San Lorenzo are an impressive combination of Gothic architecture and Catholic tradition. Highlights include the Basilicas of Santissima Annunziata and Santa Maria delle Vigne, one of the city’s oldest Catholic churches. Escape from the seaside to Sarzana, an easy bus-ride from La Spezia (or drive from the villa). Relax in the town’s pretty piazzas or imagine battles past at either the ancient citadel or in the hillside castle with its great views. In August, the ‘UCCA’ celebration has locals, dressed in robes and hoods, electing the most eccentric person of the year, with much laughter, rhymes and music. In October, the Feast of Our Lady of the Rosary features a procession to the sea followed by fireworks. In the Gulf of La Spezia, August’s Palio del Golfo (part of the Festa Del Mare) features 13 teams from nearby towns rowing for two kilometres. It takes about 10 minutes to complete, with a focus on fun – although local pride is at stake. Occupying a peninsula, Sestri Levante has the Bay of Silence on one side, the Bay of Fables on the other. The latter honours former resident Hans Christian Andersen and the narrow streets of its fairytale centre house ancient churches, Art Nouveau villas and grand gardens. Labour Day (Festa dei Lavoratori) a national holiday when shops and banks may be closed and museums open for shorter hours. The Sagra del Pesce in Camogli honours the patron saint of fishermen. Join the crowds on the pretty marina for fireworks, bonfires and a fish-supper cooked in a 4m-wide frying pan! The Sagra del Limone, held in Monterosso al Mare, Cinque Terre, is an immersion in all things citrus, from pies and cakes to limoncino, alongside lemon-themed walks and awards. Republic Day is a national holiday celebrating the birth of the Italian Republic in 1946. Although businesses close, most restaurants remain open. The Sagra dell’Acciuga Fritta (Fried Anchovy Festival) in Monterosso al Mare is a chance to join a fishy feast of these little fish, served up with Cinque Terre white wine. St John the Baptist Day is celebrated in Genoa with parades, music and sporting events, along with a blessing of the sea, fireworks and the lighting of the ceremonial bonfire at midnight. It’s also celebrated in Riomaggiore and Monterosso. The Feast of St James and the Festival of the Sea are celebrated together in Levanto. There’s a parade, remembrance of those lost at sea and hundreds of lanterns lit over the water, followed by fireworks. The Festival Massimo Amfiteatrof Levanto in Levanto is dedicated to the grand cellist Amfiteatrof and features outstanding classical music performances in various locations around town. The Stella Maris Historical Waterfront Pageant in Camogli sees a fleet of colourfully decorated boats set sail from the port in this traditional celebration of the Madonna. La Torta dei Fieschi in Lavagna is the re-enactment of the lavish 1230 wedding between the Count Fieschi of Lavagna and Bianca dei Bianchi of Siena, with a procession, music a ‘find your soul mate’ hunt. The Miracle of the White Madonna in Portovenere includes a torchlight procession and the Church of San Pietro is illuminated with hundreds of candles. Recco’s Sagra del Fuoco is a spectacular fireworks competition featuring Italy’s masters in pyrotechnics, followed by concerts and processions, with plenty of food too. Genoa’s International Boat Show brings together up to 500 boats, including super yachts, for this floating spectacle. Guarding the mouth of the Gulf of Poets, Portovenere is a picture-postcard harbour town. Walk from town to the nearby headland and you’ll see a plaque, commemorating Byron’s now collapsed cave and the poet’s ‘in-water prowess’ – he was said to have swum the bay just to visit Percy and Mary Shelley. On the promontory itself, the well-preserved 13th-century Chiesa di S. Pietro overlooks the waves. Further on, you can enjoy more views from the terrace of the Genoese Castello Doria fortress. Also on the Golfo dei Poeti, this naval town has a number of museums, including one with ships' figureheads and maritime paraphernalia and another with a fascinating collection of letter seals. As well as an atmospheric Old Town there’s also an archaeological museum with Roman artefacts and boats of all sizes are on view from the esplanade – one of the town’s several luxuriant green spaces. Stand with your back to the water and you’ll see the Apuan Alps in the distance. This wonderfully old-fashioned Riviera resort is resplendent with palms, comfortable hotels and ancient buildings. Catering mainly for smart yachts, its harbour also supports a small fishing fleet that supplies a daily market. The seafront has restaurants, bars and gelaterie too, while the town features a small castle and the churches of Chiesa dei Frati Cappuccini and Chiesa Di San Giacomo Di Corte. The 17th-century Villa Durazzo hosts concerts and other events, with lovely garden terraces open to the public. Often used as a base for exploring the Riviera di Levante (east of Genoa), Rapallo’s own attractions shouldn't be overlooked. A short promenade faces the large harbour with a medieval castle to one side. Behind the seafront, the grid of old streets is a reminder that the town was once a Roman settlement. Further back, you can take a cable car up the mountain to see the impressive interiors of the Sanctuary of Montallegro and admire the spectacular views. Accessible only by sea, San Fruttuoso is home to an ancient Benedictine monastery and the Cristo degli Abissi, a submerged bronze statue of Christ standing on the sea bed. From a glass-bottomed boat, you can see Christ's face and arms raised up towards the light. A replica is in the church next to the domed monastery, a combination of medieval and Romanesque architecture, which also includes the burial vaults of the aristocratic Doria family of Genoa. Backed by vertiginous hills and fronted by a stony beach and small harbour, Camogli is popular with holidaymakers (including Italians) wanting to stay in an authentic coastal town. Along the seafront are long lines of multi-storey pastel-painted palazzo, as well as restaurants serving the day’s catch delivered by the town’s fishing fleet. Other sights include a domed church on the wooded promontory nearby, Camogli’s own church behind the beach and a ruined fortress.